Eric Smiley is a former international event rider who represented Ireland at European, World, and Olympic level, winning team bronze medals on two occasions. Smiley began his equestrian career in the Pony Club and continued it in the army and then the world-renowned Talland Equestrian Center, during which time he gained his British Horse Society Instructor’s certificate. In 1995 Smiley passed his British Horse Society Fellowship exam, the highest teaching qualification in the industry. 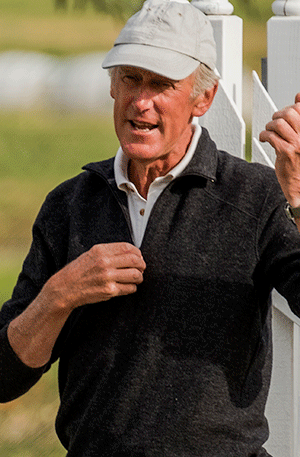 He was Team Coach to the Belgian Eventing team for the 2011 European Eventing Championships and 2012 London Olympics and is an FEI judge who regularly acts as a Ground Jury member. Smiley is the author of the cross-country bible Look… No Hands! and travels the globe helping professional and amateur riders achieve their goals.